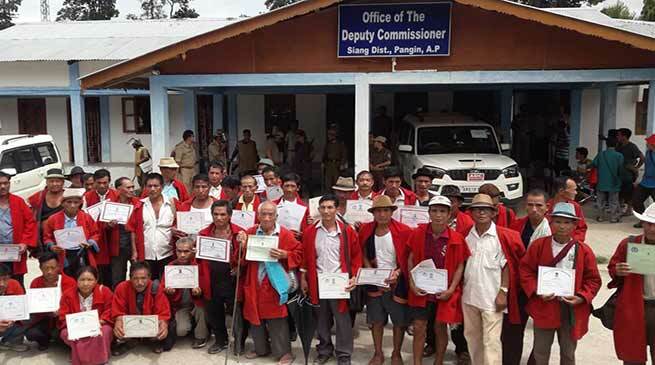 In protest against the government’s alleged attempt to shift the already notified Siang District HQ from Pangin to Boleng 52 Gaon Burhas of Pangin and Kebang circle submitted their resignation at Siang district DC office on Tuesday. In their resignation letter, the GBs quoted that, they are aggrieved over decision of the state cabinet of 12th March 2018 last to shift the district HQ to Boleng for which the bill is said to be presented in the ensuing monsoon session of state assembly. The Gaon Burhas termed the decision of the state cabinet as inconsistent, illegal and politically motivated. “the foundation stone of newly created Siang District HQ was laid at Pangin by the then Chief Minister, Nabam Tuki under Congress Government, people has already donated huge stretches of land for the new district HQ at Pangin, but the present BJP government is forcefully shifting the HQ to Boleng by changing the previous government notification by certain amendment in the ensuing State Assembly session and the move of the state government is strongly condemnable ” Gaon Burhas alleged. However in the absence of DC, ADC Tarik Talom advised the GBs to have a second thought over the resignation as state government has not taken any such concrete step to fully shift the district HQ from Pangin to Boleng, but GBs didn’t agree over the advice and have submitted their red coats, appointment letters etc. The GBs threatened for a indefinite bandh will be declared after 30th August if government do not rethink over their proposed decision of shifting the district HQ. Meanwhile, taking precaution of any untoward incident at Pangin-Boleng in the 72 hours bandh called by people of Pangin, the security of the area has been enhanced by posting several police personnel by the state government.